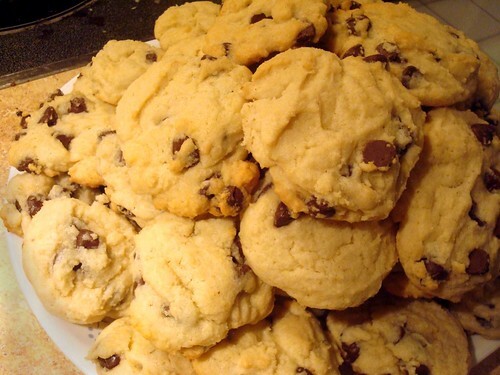 Another recipe from the depths of my draft folder...Puffy Chocolate Chip Recipes. These were part of our holiday cookie baking extravaganza this year as a way to incorporate an old favorite but amp it up a bit. 1. I loved how these pillowy cookies kept their shape--this is combination of the stiff dough and the chilling before baking step. If the dough is not cold enough, they will spread in the oven. 2. And when I say stiff, I mean difficult to mix in the chocolate chips by hand. 3. We used white sugar, which is how I've written the recipe here, though the original called for brown sugar. It worked and was quite tasty, but I think brown sugar would have given it a nicer depth of flavor.